Not everyone suffers from seasonal allergies, but if you or your child do suffer from seasonal allergies, there is no doubt that you start to dread when that season comes around. The most common seasonal allergies are during the spring and early summer and the response to pollens are very plain to see. However, there are many people who are also affected by seasonal allergies during the fall. Sometimes, people who are affected by spring allergies are also affected by fall allergies. However, some people may only be susceptible to one of the seasons. 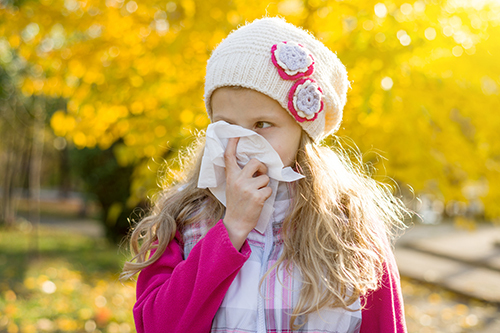 If you or your child has started to sneeze now fall is emerging, it is possible that seasonal allergies are to blame. Once plants start to produce pollen your nose is generally aware of it even if you are not. If you have suffered with seasonal allergies, then the itching eyes and constant sneezing and runny nose are symptoms that you are all too familiar with. Most people are unlikely to be allergic to all pollens, they will generally respond to one type of pollen and as such will only have symptoms at the time that plant produces their pollen. For example, tree pollen is common in the spring, when many people start to exhibit symptoms. During the summer, grass is more the culprit that affects pollen sensitivity. Plants, trees and flowers produce pollen all year round and each specie produces pollen at different times of the year and during the fall, weeds are the more common pollen produces that cause symptoms. Ragweed is high on the list of pollen producers in the fall that adds to the misery of seasonal allergy sufferers. It is said that 75% of people who react to spring pollenating plants will also react to ragweed pollen from August until colder weather kills off the pollen. Not everyone is allergic to pollen, some people also have symptoms caused by mold. Mold can not only be found in a house that is damp or badly ventilated, but falling leaves left on the ground which are then susceptible to falling rain and fluctuating temperatures can also cause the perfect condition for mold to grow. If the weather changes, as it frequently does in the fall, and becomes humid, then the mold spores can be carried away through light breezes. This is a common allergy and although it is not specifically caused by the fall, dust mites will have migrated to nice quiet, dark areas, such as your heating system. Once the weather cools down sufficiently and you turn on the heating system. Then those little dust mites are forced out into the air, where you encounter them. The first you might know about it is when you or your child start sneezing. Many children would love to say they are allergic to school, but for some it may be the case, however, it would certainly not be enough to keep them away from school. Some of the possible causes of allergies in schools could be to chalk. Really this is just a dust allergy as your child responds to the minute particles that irritate their nasal cavities. However, some schools have pets in the classroom, especially for smaller children, and your child may have a response to their fur. This is something you may not even know if you do not have pets at home and it may take a little time narrowing it down. If in doubt, consult an ENT specialist, who can alleviate the symptoms and pinpoint the cause. ← Does Your Child Need A Cochlear Implant?